Easily the most powerful presentation I saw in New Orleans was a tour put on by the non-profit Neighborhood Story Project. Saturday afternoon my wife and I met up with Jane and her daughter to take the tour and I’ll try to do justice to the tour in the pictures and information posted here. 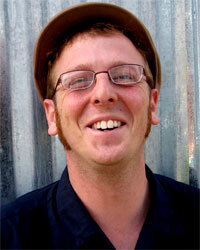 But really, nothing can convey the sense of dismay and anger mixed with hope and courage that the tour fostered. Led by Abram Shalom Himelstein and Rachel Breunlin, co-directors of the non-profit group, we piled into two vans that took us through New Orleans and out toward the site of one of the levee breaks (the 17th Street Canal) and from there into the Lower Ninth Ward, the scenes of the worst of the destruction following Hurricane Katrina nearly three years ago. Rachel was the guide for the van I was in and she was a wealth of information about the context of Katrina in terms of the history of New Orleans and the aftermath politics of the situation. As we departed the Hilton, she explained that, contrary to expectations, the high ground in New Orleans is along the Mississippi (where the Hilton sits and the French Quarter) since whenever the Mississippi of yore flooded, it deposited silt next to it, effectively raising that ground. 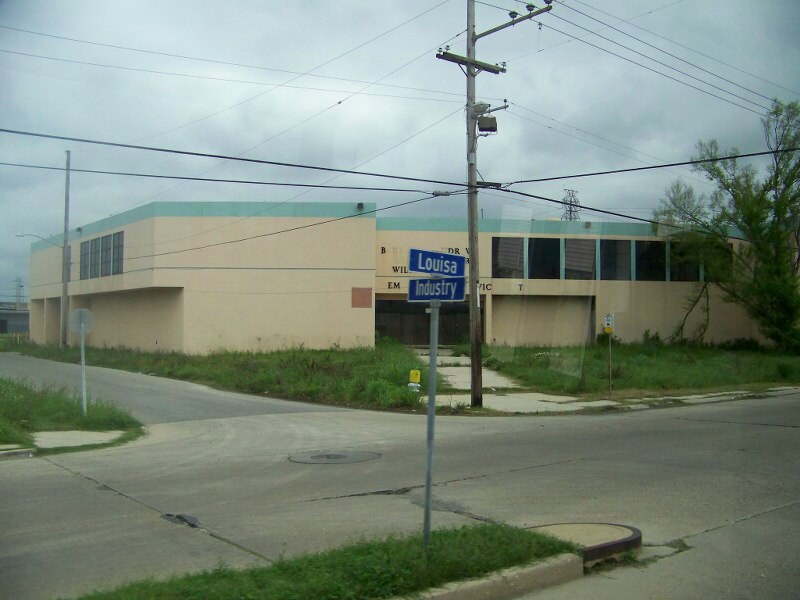 The rest of New Orleans slopes away toward lake Ponchartrain and the Gulf of Mexico. 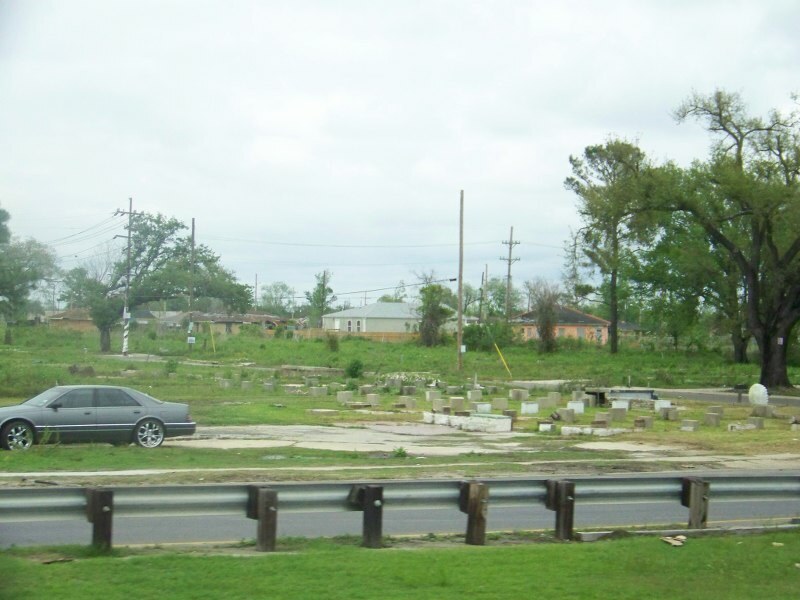 Most of the city is below sea level, a fact painfully apparent in the aftermath of Katrina. 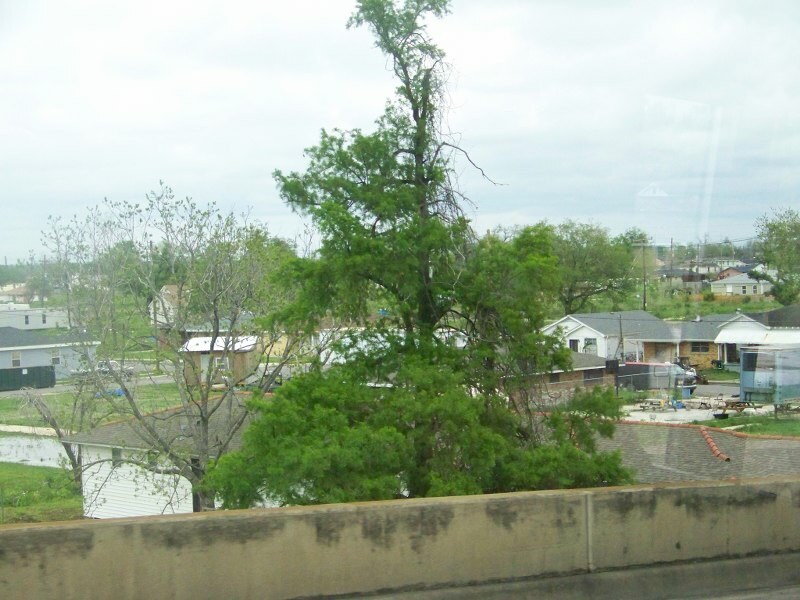 Since the storm itself mostly missed New Orleans (there was wind damage, but the exact landfall was away from the city), initially it was assumed the city would be okay. However, the sea swell from the storm overwhelmed the city’s flood walls and the rest is a painful history of death, destruction, political ineptitude, and profiteering–a history not fully written yet. 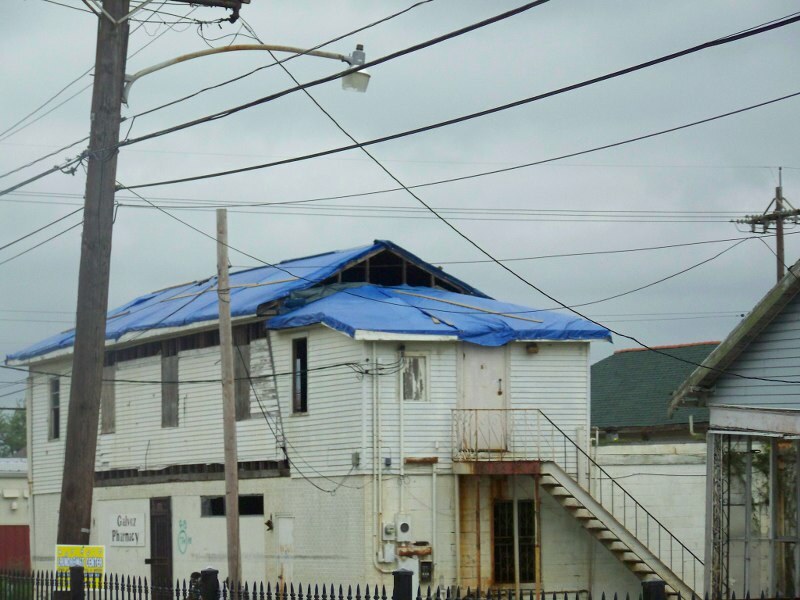 On our way to the levees, we passed the first evidence of the bureaucratic nightmare New Orleans has had to face in just about every aspect of recovery. The city has no money to rebuild with–and the federal government will only give money to tear down, not rebuild. 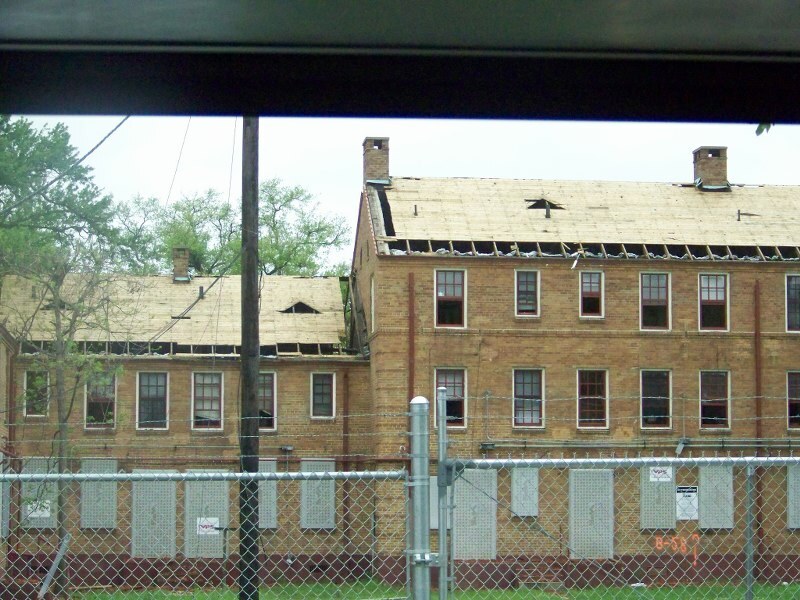 As a result, historic neighborhoods and housing projects are being demolished rather than rehabilitated. 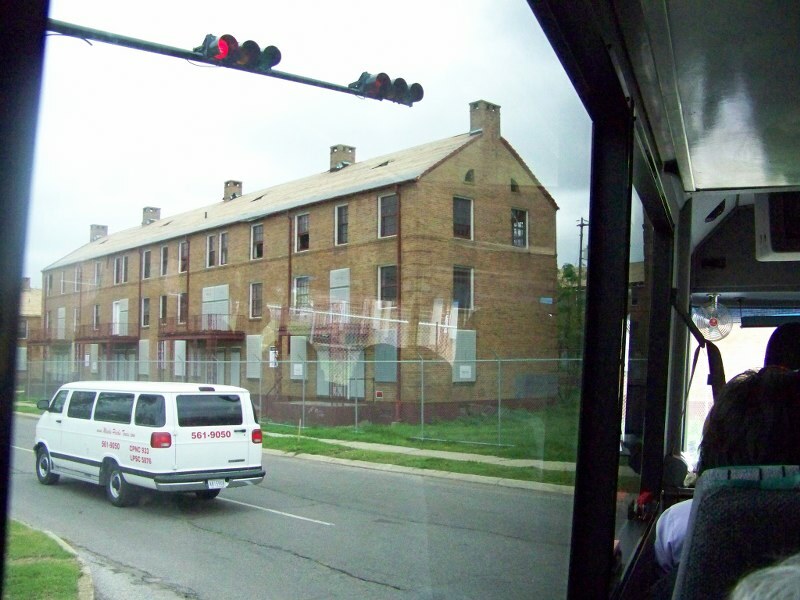 The housing projects are many blocks long, three-stories high, and were home to hundreds of low-income families–all of whom are displaced and, in all likelihood, will never return. 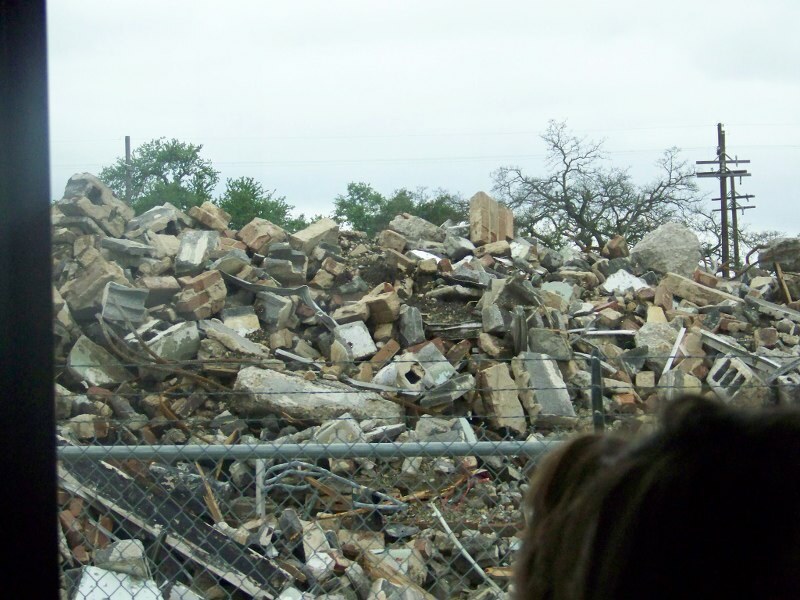 The fate of these housing projects, though fiercely contested, is pretty much decided, as the rubble in the picture above attests. 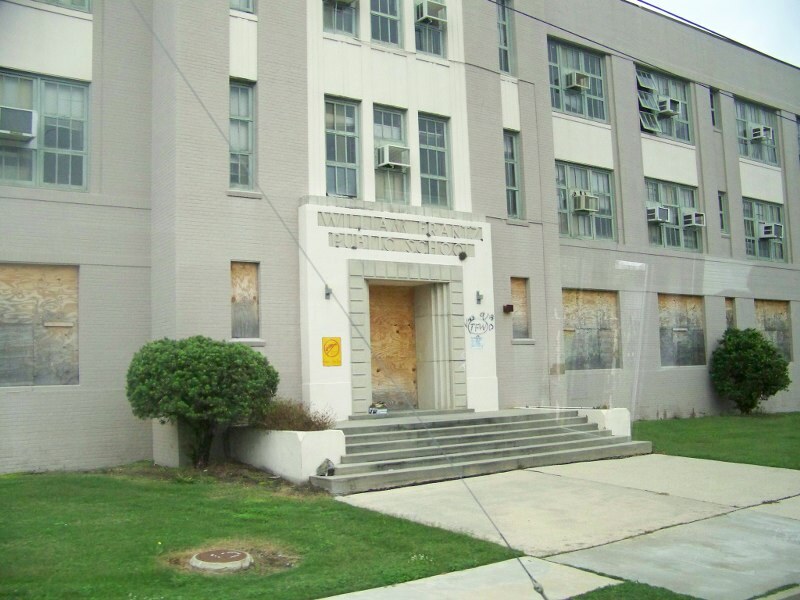 Among the candidates for the wrecking ball is William Frantz Public School, one of the first desegregated schools in the deep south. In 1960, little Ruby Nell walked up the steps of that school alone amid a daily torrent of angry white vitriol. Surely there is something in that edifice worth saving as one reminder of the worst ignorance and racism can bring about. 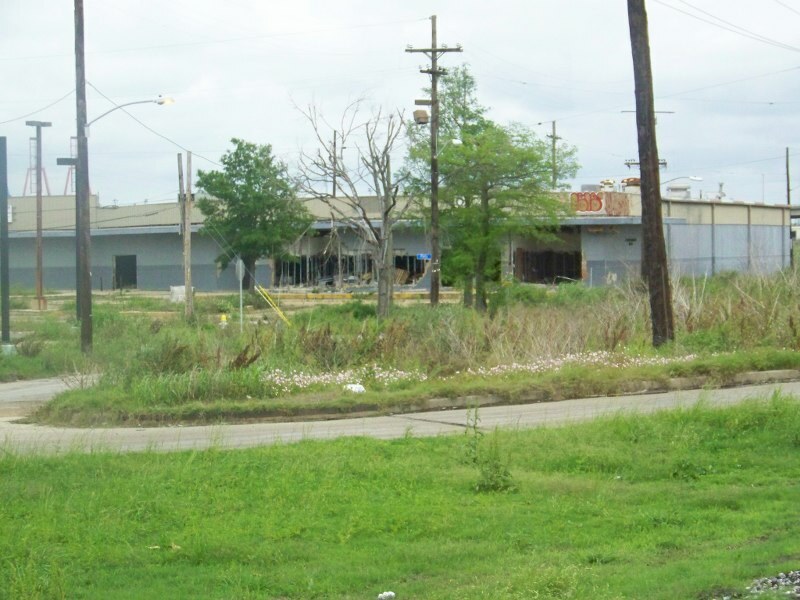 Our first stop at a levee break was along the 17th Street Canal. 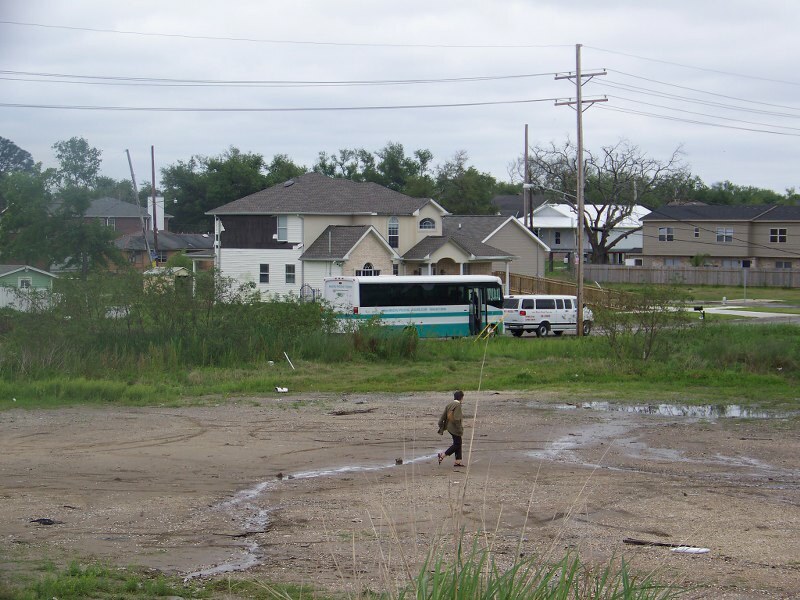 The site of the worst of the levee disasters, we were able to get out of the van to view the situation first-hand. 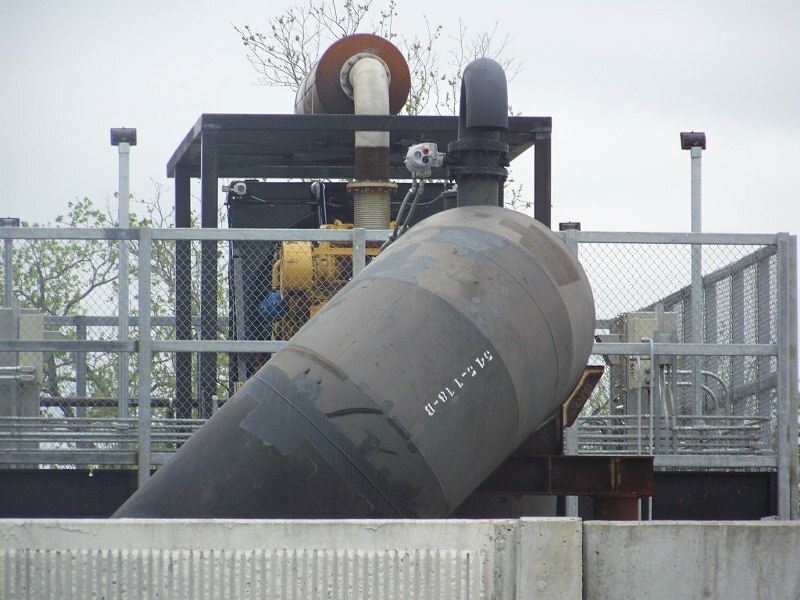 Because New Orleans is below sea level, it is constantly pumping ground water into a canal system that takes the water out to Lake Ponchartrain. 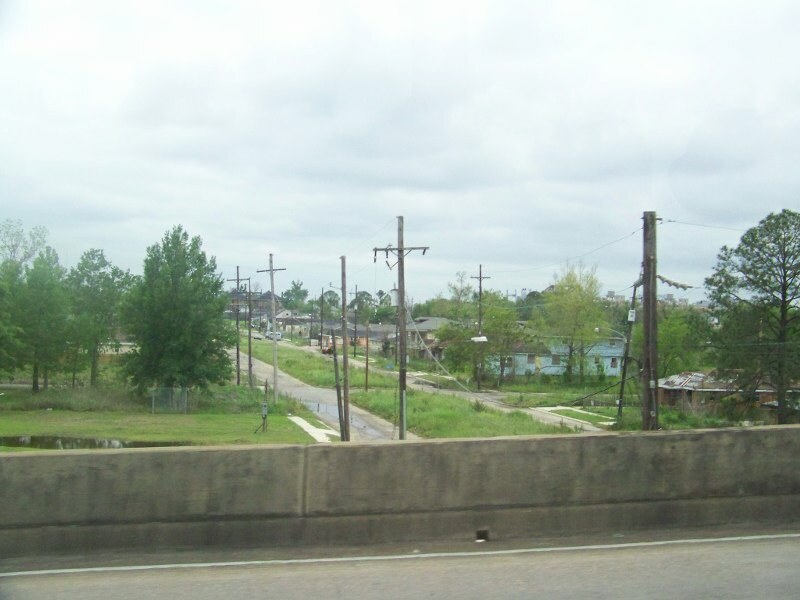 The sea swell from Katrina traveled up these canals from the lake creating a backpressure that eventually overwhelmed the system. The first picture above shows the new concrete in place at the site of the levee break. 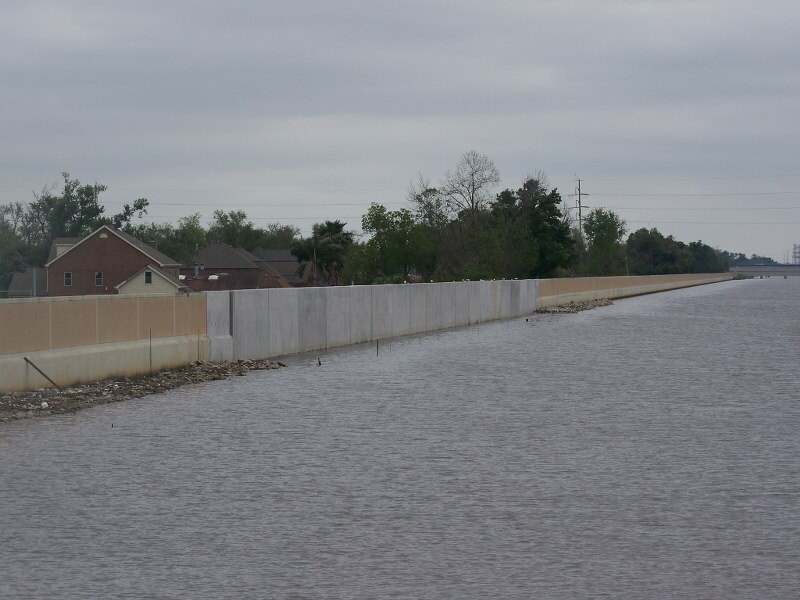 The water in this spot did not top the levee’s concrete floodwall–instead the earth beneath the wall gave way, since the Army Corps of Engineers used peat and sand as part of the levee base which allowed water to percolate through to create an unstable situation. A satellite image of the flooding that followed can help with the visualization of the result. 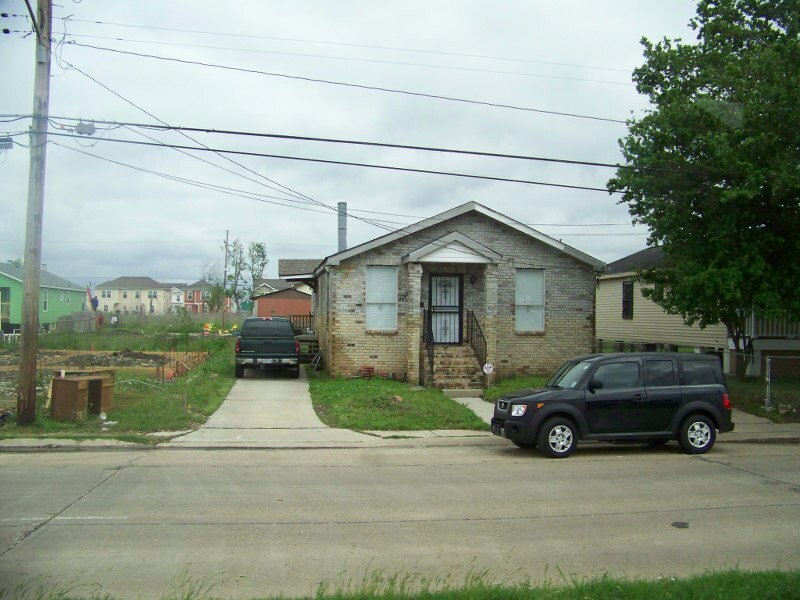 What we saw was a loose collection of rebuilt homes amid empty lots and abandoned buildings. 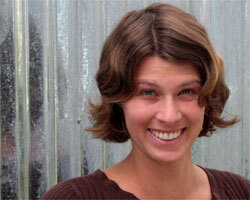 Rachel explained that the levees have not, as one might expect, been fixed. 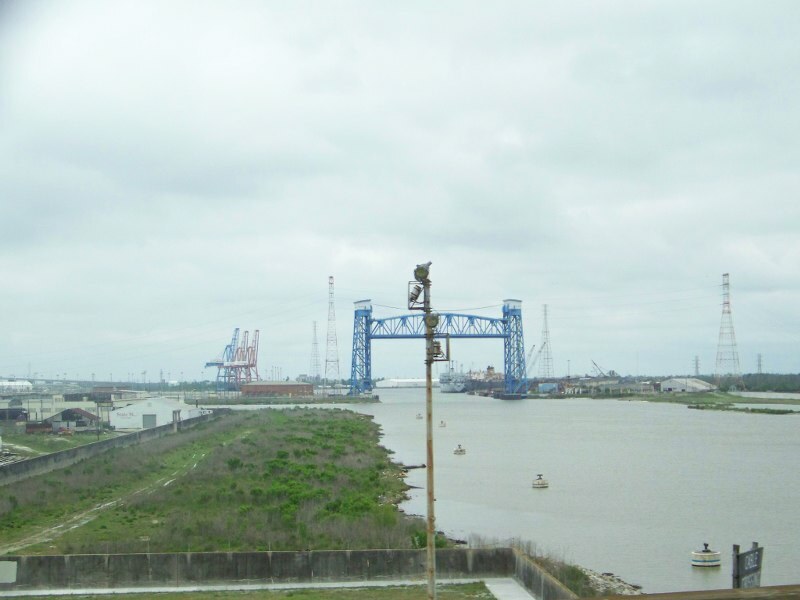 Instead, the Army Corps has installed a sea wall in each canal where they drain into Lake Ponchartrain that is designed to close in the event of another sea swell. Then, great pumps the size of houses are supposed to pump the canal water over the sea wall so the levee is not strained. 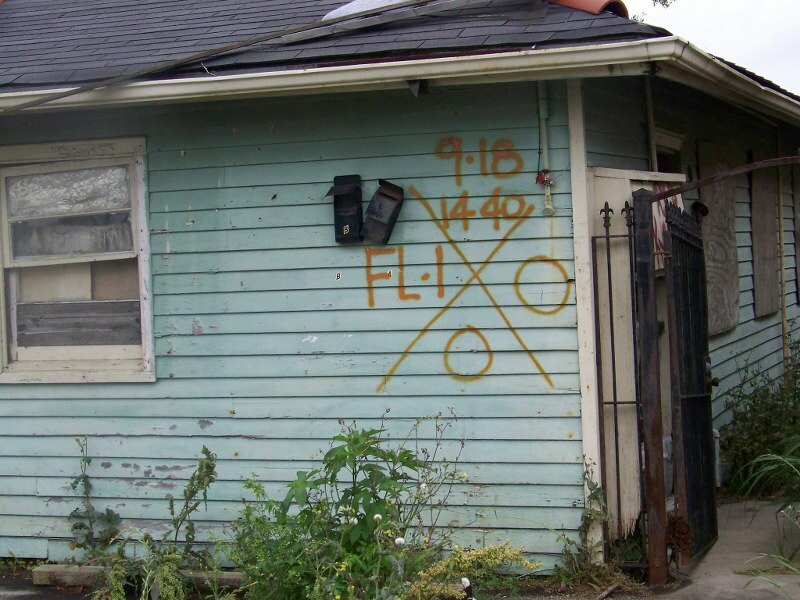 National Geographic has a page about this work and you can decide for yourself how much you would trust the Army Corps if you were a New Orleans resident. 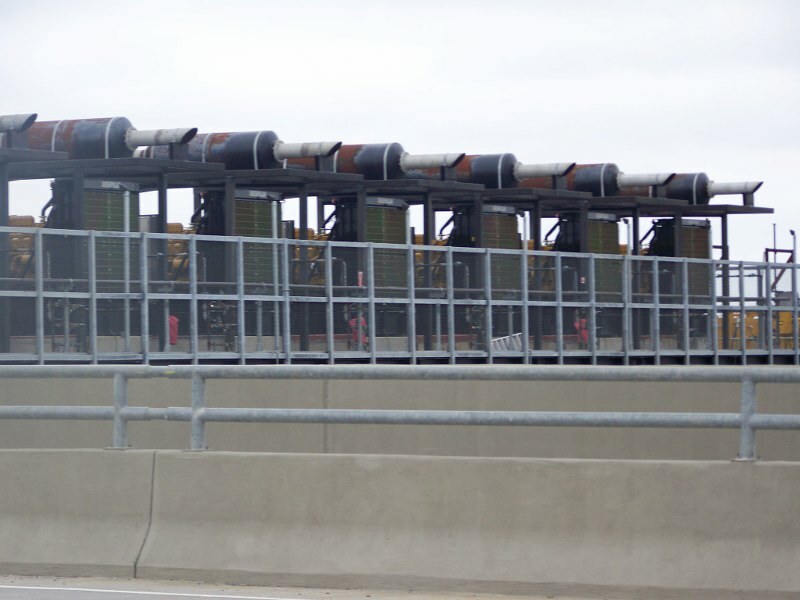 The pictures below are of the pumps. 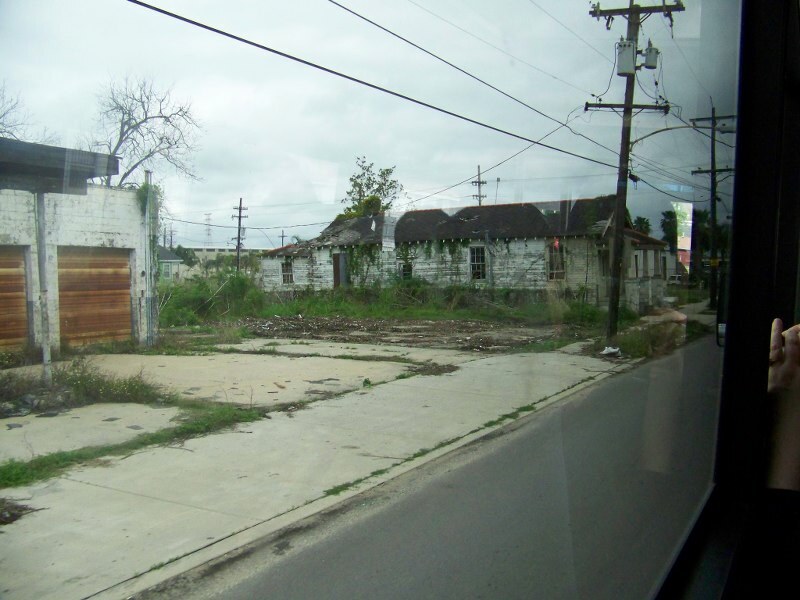 From this area, the tour took us across the Industrial Canal and into the Lower Ninth Ward where the scenes of devastation were the most poignant. 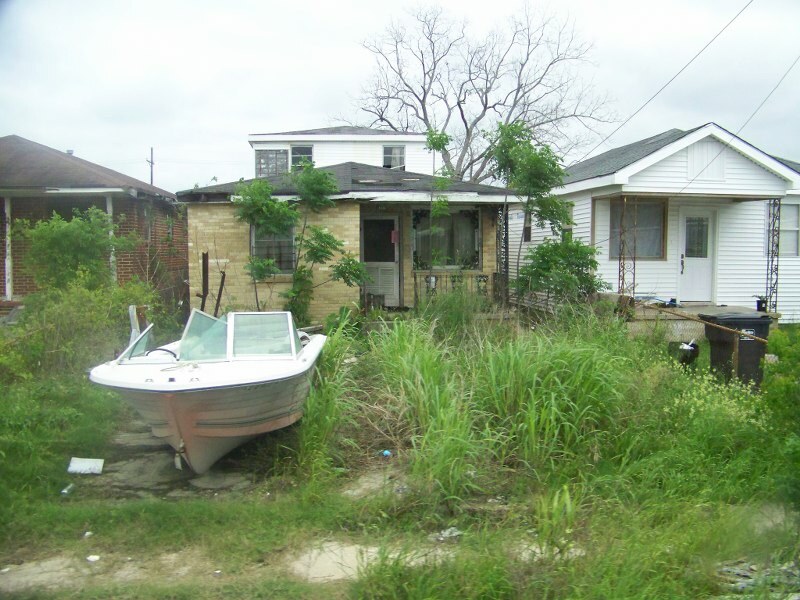 This area, traditionally poor and predominantly Black, a remnant of urban segregation policies, was overwhelmed immediately by the sea swell that traveled up the canal unabated. In the pictures below, you can see the older flood wall on the near side of the bridge and the new concrete of the repaired flood wall across the canal. Note the distance traversed by the new concrete wall–miles of the wall were eradicated in an instant. 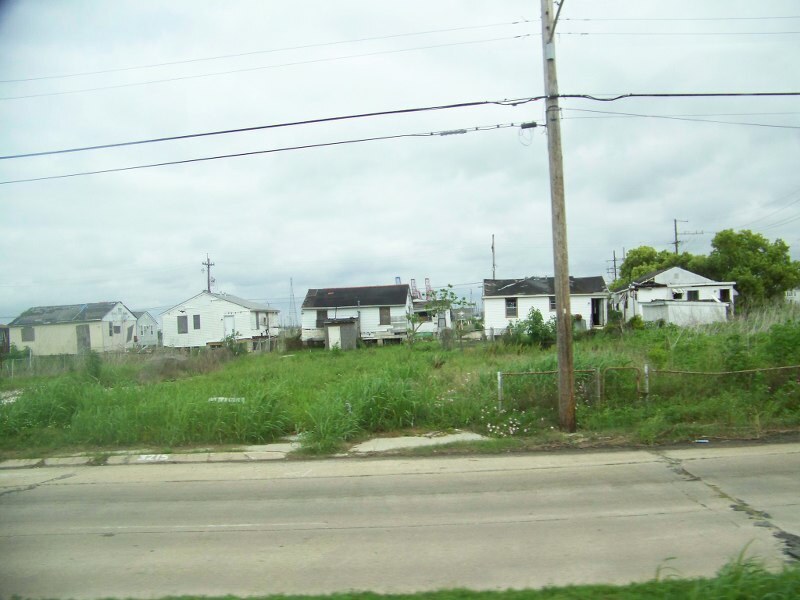 The two or three houses here and there are separated by vacant lots of weeds and cracking concrete foundations–an urban wasteland where a community once stood. 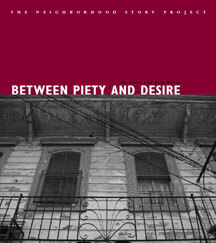 We visited the community of Desire. 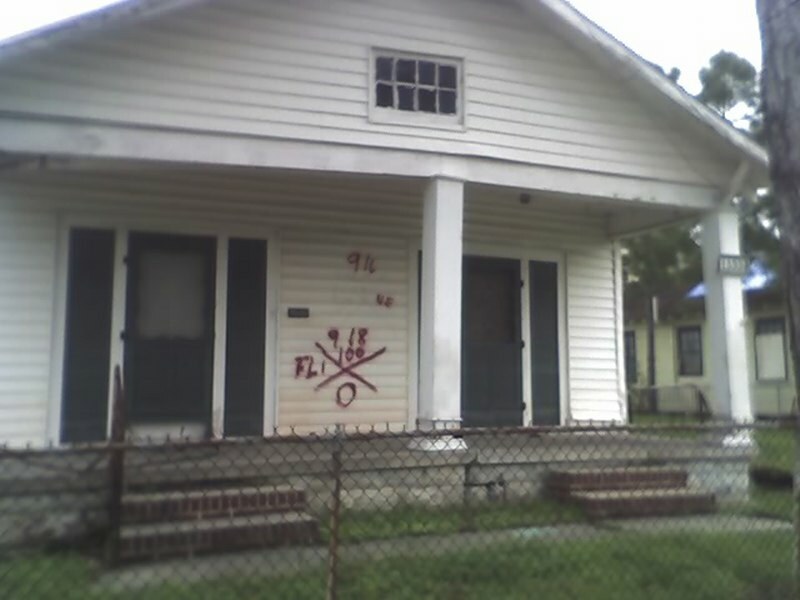 In these communities, nearly three years after the storm, the most graphic descriptions of failure and despair come not from the abandoned houses and buildings (which are bad enough), but from the marks painted on the houses from the National Guard search teams who had to look through the buildings for the dead. 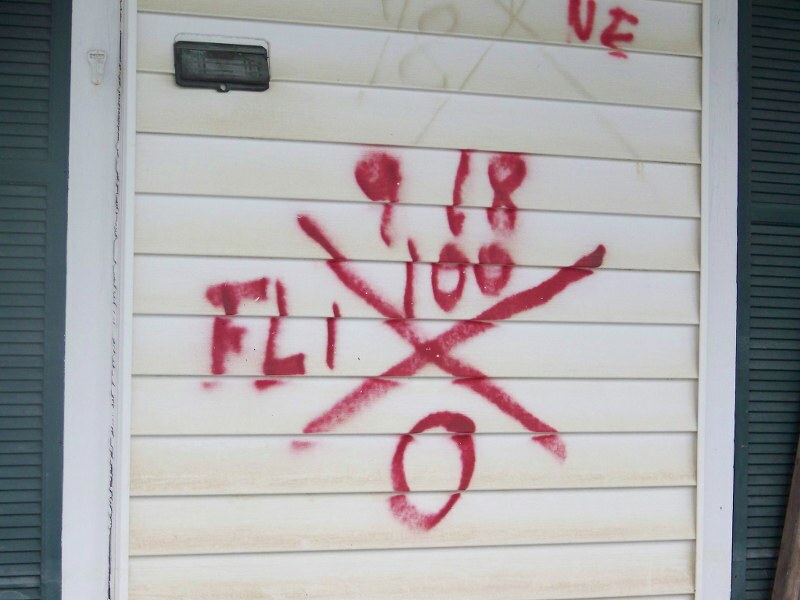 They painted red Xs on the sides of buildings to indicate they had been searched. On the left of the X is the troop number that did the search, the top of the X lists the date and time of the search, the right side of the X lists whether any dead animals were found. The bottom, of course, is for any human bodies they found. Imagine that you are trying to rebuild in a neighborhood, every day reminded by these Xs of the losses suffered. In one image, you can see the water line where the flooding came up to (about 6 feet from the ground). 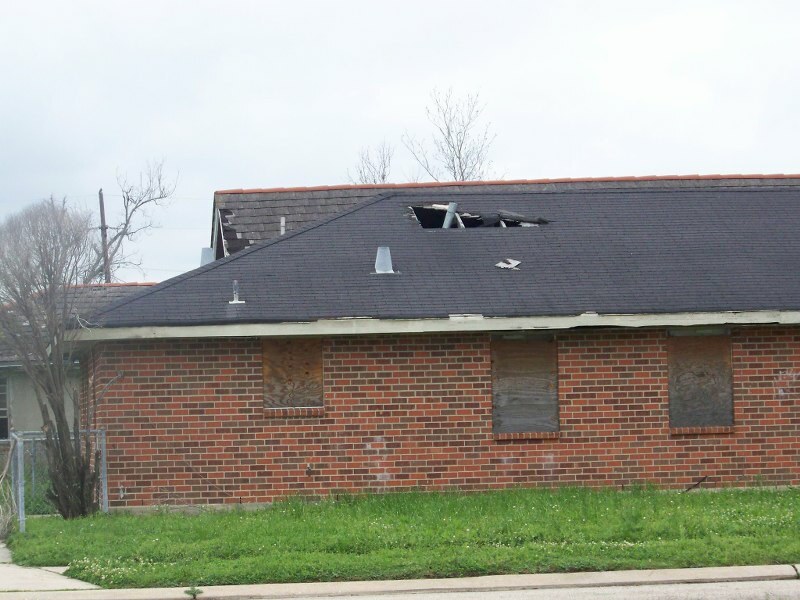 In another image, you can see a hole in a roof where residents broke through to climb out above the flood waters. 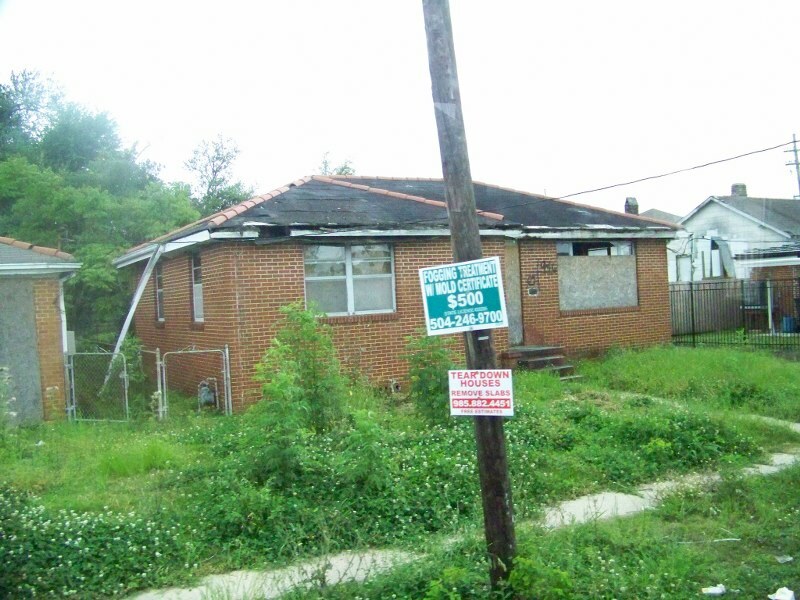 The rest of these neighborhoods is weeds and crumbling structures. 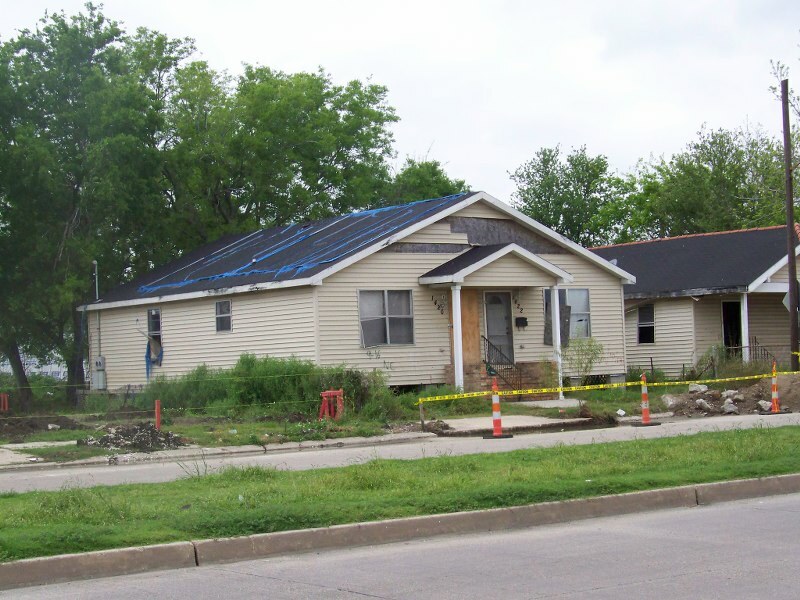 Some homes show the remnants of blue tarps stretched across their roofs. 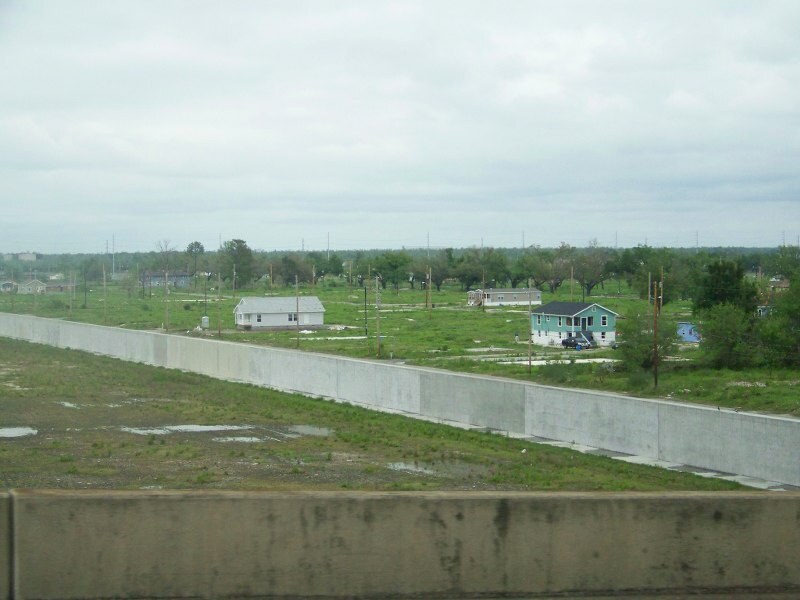 The Blue Tarp program is one of the more visible examples of government-sponsored mis-allocation of funds in the wake of Katrina, along with the FEMA-trailer boondoggle. 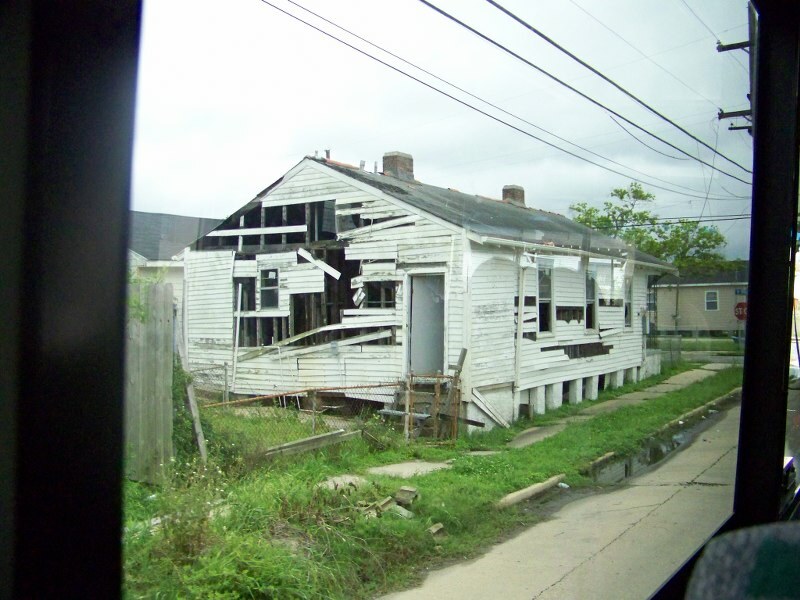 It is little wonder that the people most affected by Katrina have no trust at all in the government. 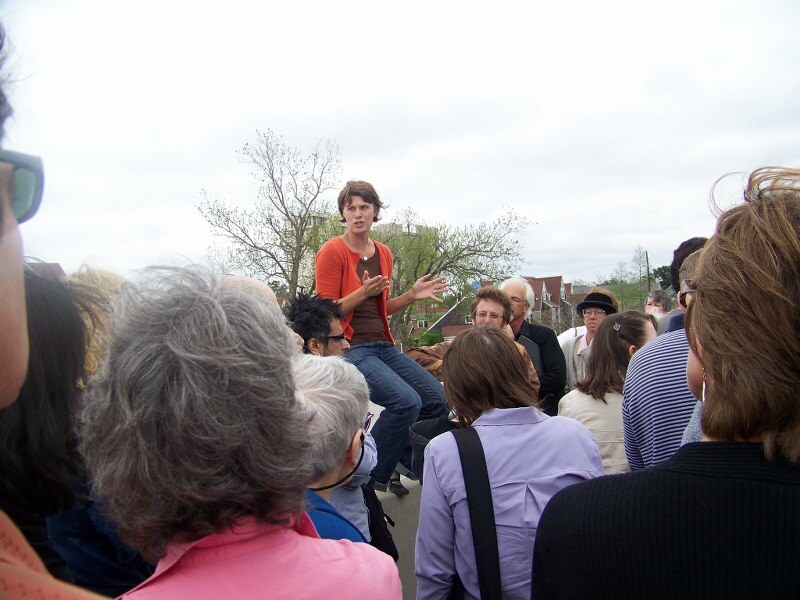 As the tour was ending, Abram and Rachel talked about some of the bright spots amid the disaster. We visited a small museum in the middle of the Ninth Ward that had managed to rebuild and had salvaged some of the history of New Orleans from the wreckage. Because his neighbors still had intermittent power, thick temporary power cords stretched off from the museum in all directions–the community still exists and neighbors are helping neighbors. And the Neighborhood Story Project itself works in neighborhoods and local high schools, helping people cope with their lives by writing. 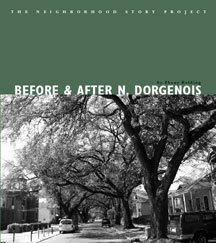 The Project publishes books of students writing about what their neighborhoods were like before and after Katrina. The stories are heartbreaking and hopeful all at the same time. 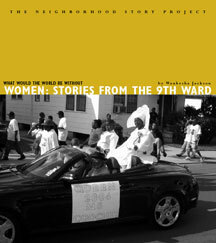 If you want to help–purchase a book or two from their web site. All proceeds fund more such projects–and there is so much need. 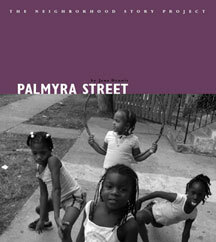 The images below are of just a few of the books available.